Our older son is spending the night at a friend’s house tonight. It’s not his first sleepover. But, just before bedtime, he asked his friend’s mom if she would call me. He was fine and happy. He just wanted to call so he could say goodnight. I’ll still be smiling about that when I pick him up tomorrow. We celebrated the Year of the Dog! We have a party every year for Chinese New Year, but this year I dragged my feet in planning it. I wasn’t sure we were in a party mood, and we’ve been working on our basement for a while, so I wasn’t sure we would have anywhere to send the children to get the energy out. We had 21 children RSVP yes to the party, and our house barely contains 2 some days, so this was a legitimate concern. But it snowed the day of the party, and the children ran out to battle with light sabers in the snow. So we had plenty of room inside. I realized I’m a very uneven party thrower. 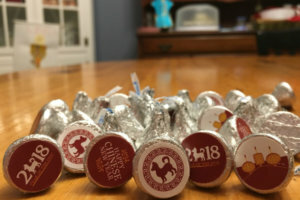 I go way over the top ordering stickers to make Hershey kisses into Dog kisses, but I don’t start food prep for the party until about an hour before guests arrive. Yet somehow people come back year after year. 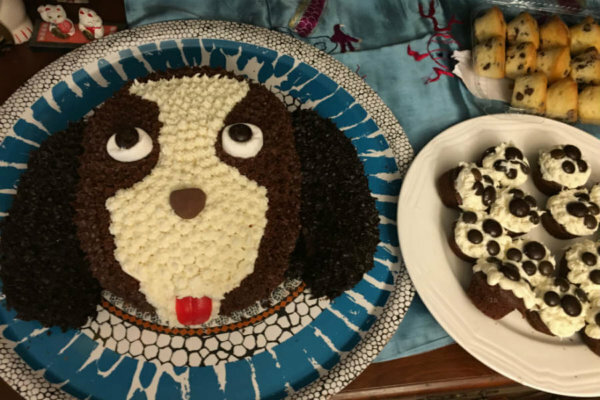 And I have a friend—who also happens to be Daniel’s godmother—who has this incredible talent for making animal cakes. Maybe people come for the light saber battles. Or the goody bags. I know some grownups aren’t into goody bags, but I know how hard it is to leave when you’re having a good time. Everyone needs a little something to take along to make the departure just a bit sweeter. And it might just happen to be a Year of the Dog kiss. This year I tried to mix up the party a bit by having not just Chinese food. And, instead of serving entrees, we kept it strictly to appetizers. I don’t know whether the guests preferred it, but we aren’t on our eighth straight day of eating pork fried rice and chicken lo mein, so I’m calling it a win. 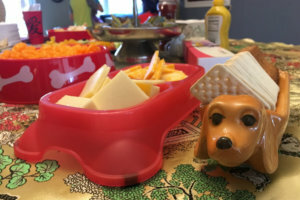 Alongside the Chinese dumplings, spring rolls, and an incredible sesame noodle dish a friend made, we served hot dogs, paw-print-shaped Cheetos in a new, clean dog bowl, veggies and dip, cheese and crackers, and some yummy ham and Swiss sandwiches. Next year is the Year of the Boar or Pig. I think the sign of a good Chinese New Year party is when 15 minutes into it, the guests are discussing whether you should roast a pig on a spit the next year. Or maybe they were just really enjoying the hot dogs and the ham sandwiches. Had I mentioned we were working on our basement? 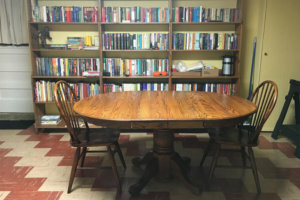 We had the basement refinished over Christmas, and John has been painting it and installing bookshelves. It looks amazing to me. And at our Chinese New Year party one of our guests offered us a table and chairs that she dropped off this week. I’m getting excited for it to be finished. I’m sort of rooting for a ping-pong tournament in the basement for next year’s Chinese New Year party so…well…stay tuned. 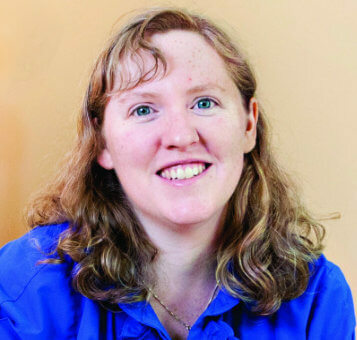 It was a weekend of partying, as our nephew who was turning 9 came to town with his mom—my sister Maureen—and his three siblings. 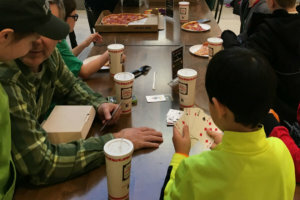 We had this fantastic plan to celebrate his birthday by cheering on the Loyola Greyhounds at a men’s basketball game, followed by a pizza dinner at our local mall. The game was a thrill, even though we lost. And then we headed over to the mall, found two tables in the food court, ordered enough food for a thousand, and had just started eating when a security guard walked over at 4:59 p.m. to tell us the mall was closing at 5. So I did what any aunt would do in that moment. I invited everyone—all 21 guests from four states—back to my house. You’ve never seen such light saber battles! And there was football and birthday singing and all kinds of fun. It ended up being a full and memorable day. At the end of the night I was exhausted. It was only later that I realized I wasn’t just tired from partying. I was getting sick. And I ended up staying sick for most of the week. I couldn’t even write. I can’t remember ever being too sick to write before. It feels good to be back to my quick takes today. 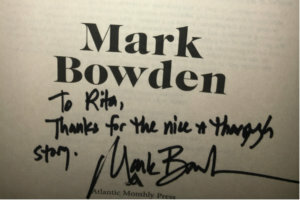 Because I was still not feeling 100 percent, I wasn’t able to go to the lecture when author Mark Bowden came to speak at Loyola Thursday night. I was so very disappointed, especially since I had the chance to interview him by phone for this story for Loyola magazine. My friend and colleague surprised me, though, and bought me his book and waited in a long line to ask him to autograph it for me! And he did. I was so touched.